To sweeten things up, in case the afternoon stretches dully and pelts the windows with sleet, I’ve just made a batch of super-healthy, incredibly delicious cookies that take just 15 minutes from start to finish. 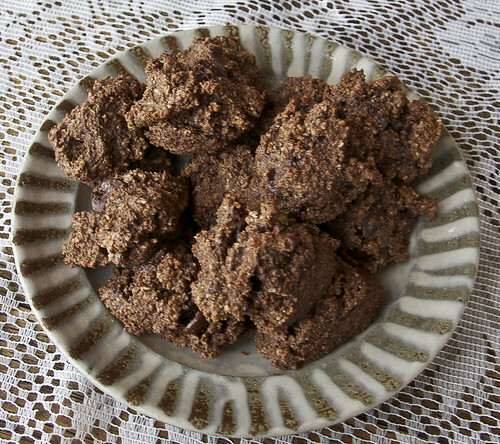 These are for spring–they have no gluten, no dairy, no processed sugar, and are endlessly malleable–change the nuts and the milk flavors, add grated carrots, hemp or chia seeds, use a bit more milk for a softer cookie, replace the chocolate with carob or don’t use at all. I vary these cookies as my mood and larder dictate. Have fun and eat them often (daily). They are GOOD FOR YOU!